I made these lime cornmeal glazed cookies (a recipe from Martha Stewart) for our valentine themed coffee hour at work yesterday. I made them years ago (back before I knew I was allergic to corn!) and so I thought I’d give them a shot again. I think people liked them (errr, at least I hope so!) so here’s the recipe in case anyone out there would like to try them out. 1. In the bowl of an electric mixer fitted with the paddle attachment, cream butter and sugar until light and fluffy, 3 to 4 minutes. Add egg; beat until just blended. Add citrus zests, lime juice, and almond extract. 2. With the mixer on low speed, add flour and cornmeal. Continue beating until well blended. Chill until firm, about 1 hour. 3. Preheat oven to 350 degrees. Line two baking sheets with Silpats or parchment paper. Using a 1 1/4-inch ice-cream scoop, form balls from chilled dough. Place balls on prepared sheets, spaced about 3 inches apart. Dip bottom of a medium drinking glass into cornmeal. Flatten balls with the bottom of glass until dough is about 1/4 inch thick. 4. Bake cookies until crisp and light-golden brown around the edges, 14 to 16 minutes. Transfer baking sheets to a wire rack, and let the cookies cool completely. 5. Place a wire rack on top of a piece of parchment paper. Pour the lime glaze over the cooled cookies, allowing the excess to drip off the edges. Let glaze set. Store cookies in an airtight container for up to 1 week. Sift confectioners’ sugar into a medium bowl. Add lime juice; stir until smooth. Stir in lime zest. Use glaze immediately. 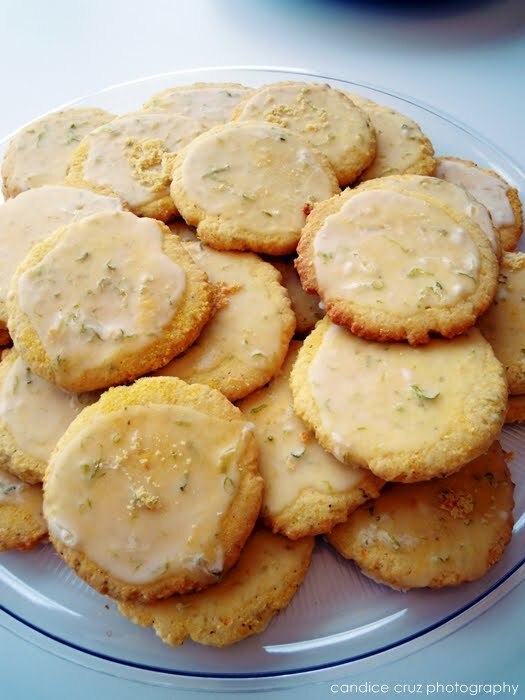 This entry was posted in cookies, dessert, lime, Martha Stewart, recipe by shortcakescraps. Bookmark the permalink.